Located on the Lys River, the Castle of Ooidonk is one of the most beautiful castles of Belgium. Originally built in the 13th -14th century, it is a reflection of the Flemish-Spanish style of architecture that gives this castle its distinctive "Danish cookie jar" like appearance. The family which owned the castle, the Montmorencys, sold the castle in 1595 after it was destroyed several times between 1491 and 1579. The new owner Maarten della Faille rebuilt the entire castle in the Flemish-Spanish style. 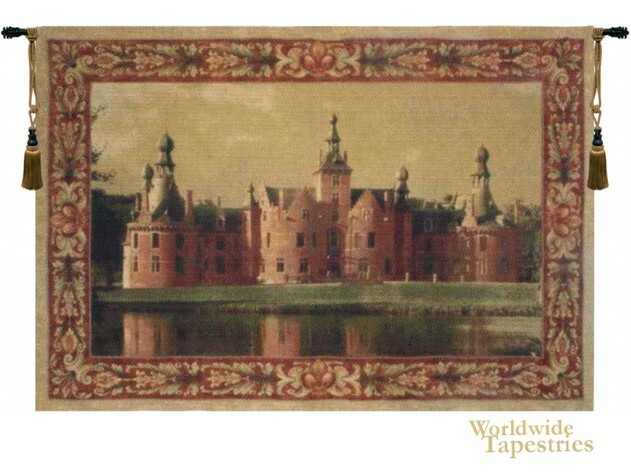 The tapestry shows the castle, basically as it looks today and is exquisitely detailed. This tapestry is unlined and has a rod pocket for easy hanging. Note: tapestry rod and tassels, where pictured, are purchased separately.